When you picture a housing development in the suburbs, you might imagine golf courses, swimming pools, rows of identical houses. But now, there's a new model springing up across the country that taps into the local food movement: Farms — complete with livestock, vegetables and fruit trees — are serving as the latest suburban amenity. It's called development-supported agriculture, a more intimate version of community-supported agriculture — a farm-share program commonly known as CSA. In planning a new neighborhood, a developer includes some form of food production — a farm, community garden, orchard, livestock operation, edible park — that is meant to draw in new buyers, increase values and stitch neighbors together. "These projects are becoming more and more mainstream," says Ed McMahon, a fellow with the Urban Land Institute. He estimates that more than 200 developments with an agricultural twist already exist nationwide. "Golf courses cost millions to build and maintain, and we're kind of overbuilt on golf courses already," he says. "If you put in a farm where we can grow things and make money from the farm, it becomes an even better deal." In Fort Collins, Colo., developers are currently constructing one of the country's newest development-supported farms. At first blush, the Bucking Horse development looks like your average halfway-constructed subdivision. But look a bit closer and you'll see a historic rustic red farm house and a big white barn enclosed by the plastic orange construction fencing. 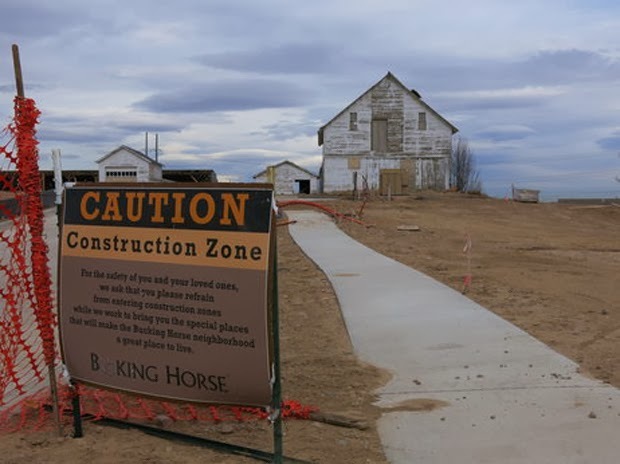 The Bucking Horse subdivision in Fort Collins, Colo., will include a working CSA farm, complete with historic barn, farm house and chicken coop. "When we show it, people are either like, 'You guys are crazy. I don't see the vision here at all,' or they come and they're like, 'This is going to be amazing,' " says Kristin Kirkpatrick, who works for Bellisimo Inc., the developer that purchased the 240-acre plot of land. When finished, Bucking Horse will support more than 1,000 households. Agriculture and food production are the big draws, Kirkpatrick says. Land has been set aside for vegetables. There will be goats and chickens, too, subsidized by homeowners. 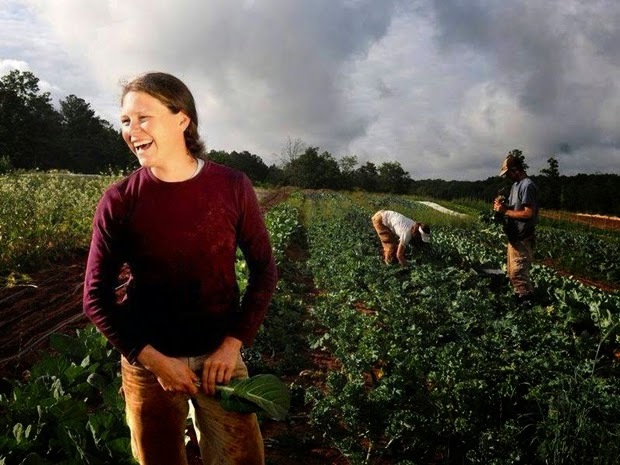 Soon they'll be hiring a farmer for a 3.6-acre CSA farm. There's also a plaza designed for a farmers market, and an educational center where homeowners can take canning classes. In short, the neighborhood plan is infused with the quaint, pastoral, even romantic view of farming. "Our public restrooms are in an old chicken coop, and it'll be half public restroom and half chicken coop," Kirkpatrick says. After World War II, Americans escaping crowded cities flocked to the suburbs. Most suburbanites didn't want to be right next to a farm, and so restrictive zoning pushed livestock and tractors out of new residential areas. Now, says Lindsay Ex, an environmental planner with the city of Fort Collins, municipalities are being forced to change their codes. "We used to have residential separated from agriculture, and now we're seeing those uses combined," says Ex. And that can be a great deal for small-time farmers, says Quint Redmond, who runs a company called Agriburbia, which operates farms within suburban developments across the country. In development-supported agriculture projects, he says, the developer, or homeowners association, ends up making the big farm purchases — not the farmer. "The best possible thing for a farmer is to have the infrastructure ready," he says. "That is where most farming goes upside down or goes broke." Not to mention that the neighborhood is filled with people who already have an interest in local food, so "there's a real market for that farmer," Redmond says. The marketing of these new neighborhoods appears to be working — at least at Bucking Horse, where the developer says 200 single-family lots were snatched up within days of going on the market. Values of existing homes have jumped 25 percent since construction began on the agricultural amenities. "Once we saw this and the plans they had for it, we were really sold on the lifestyle," says Lindley Greene, who moved to Bucking Horse in March with her husband and two young sons. Once the neighborhood farm is up and running, Greene says, she'll be volunteering to get her hands dirty. "We love the idea of it," she says. "To have it right here — not have it in our backyard, but still in our backyard — is awesome."